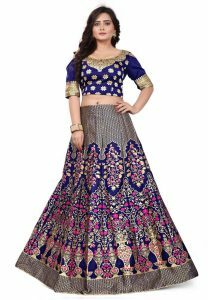 Lehenga choli is a full ankle-length skirt generally worn by women on formal wedding or other ceremonial occasions. It is a popular dress of women mainly in North India. It is secured at the waist with the mid-riff left bare. It is generally embroidered, embellished or printed and is worn with blouse that is called choli. It was a dress of ancient India, the modern designs of lehengas is traced back to Moghul era. Lehengas of many designs and types are available in market as per shape of the body of girls and women. The original form of lehengas was mainly made from cotton. The royal lehengas were stitched from silk fabric. The stitching of lehenga choli and dupatta takes about a month or so depending upon the fabric etc. 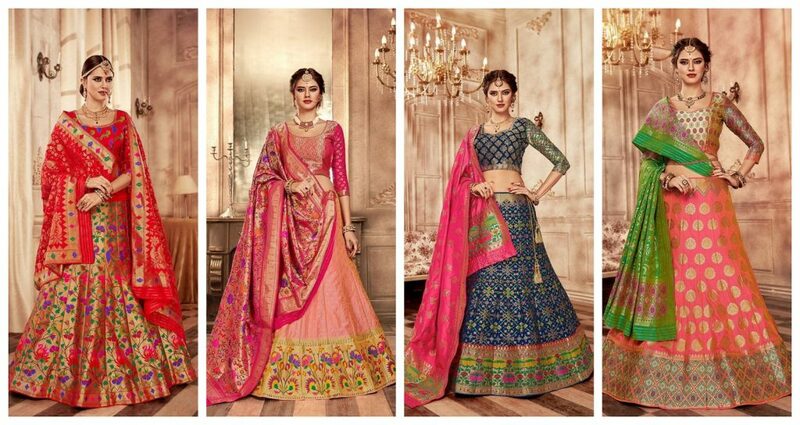 There are a lot of variations to lehengas, that is, Sharara, Gharara and Lacha, these are lower attires. Now it is three piece comprising blouse, long skirt and a dupatta. These are most popular wedding outfits. Lehenga-choli in fabrics like brocade velvet, satin and silk are suited during winter. Silk georgette, crepe are worn in summer. 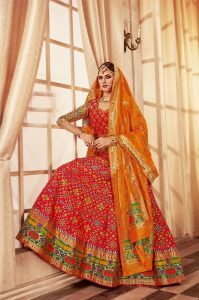 There are many styles of lehengas just as A-line lehenga, which is like A in shape, tight on waist and flaring at bottom, other is flared type, which has several of volume and peats. There are also Double-Flared Mermaid, Paneled, and Straight Trail designs of Lehengas. 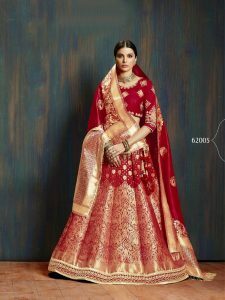 The most popular are the Banarasi Silk Lehengas worn in at weddings, and ceremonies. Banaras (now known as Varanasi) is an ancient city of Uttar Pradesh, India is situated on the bank of holy Ganga river. The silk brocade weaving started in Banaras in the seventh century. Banarasi silk is an example of excellent artistry. It was brought by Moghuls in India. Previously silk was imported from China, but now it is being provided by Southern India. Banarasi silk lehengas are considered to be one of the finest traditional lehengas. 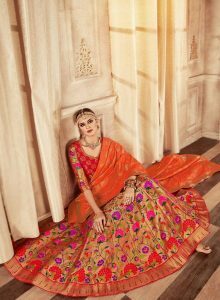 Mirraw Buy Banarasi lehenga online from saree.com. Browse and select from our large collection of designer Banarasi Silk Lehenga Choli for bride. A combination of red and golden color looks good on a bride. The bride looks graceful in this Banarasi silk lehenga. 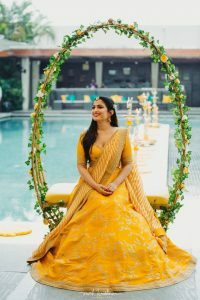 The dress is suitable to wear at night especially when haldi ceremony is going on. Floral jewelry will suit the dress. Red and orange color is a nice combination for wedding ceremonies. This is a light weight dress and the wearer will find comfort in this. This dress is good for bridesmaids as it provides them contemporary look, which is same as bride. This is a good lehenga to be worn on wedding day. This lehenga is good for the mehendi function. The lehenga will be good for young women.